Gallery of emotions or man's impressions of make-up. It is impossible to deceive man's visual impressions by means of false cosmetic make-up and void emotional images, as in any case insincere facial design only masks emotions of a female face. Quiet eyebrows and eyes seem glad as the mouth expresses joyful emotions. The joyful mouth seems calm as eyes and eyebrows express quiet emotions. 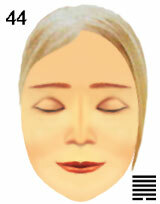 Desires of the person are calmed by thoughts, but sensations do happy facial image. Refusal of ideas and desires can cause involuntary sensations as if feelings can be happy when surrounding world does not disturb the person. man's impressions on cosmetic make-up of female face.